Came across the CASology challenge blog. This week's challenge was to use gold. I can do that! So I did. 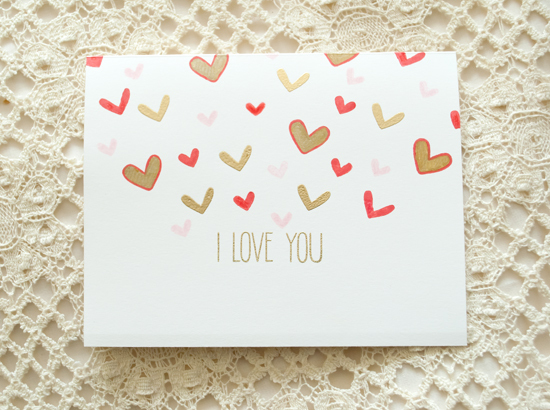 Stamped the sentiment and a few hearts in Versamark and embossed in gold. Filled in other hearts in red and pink. 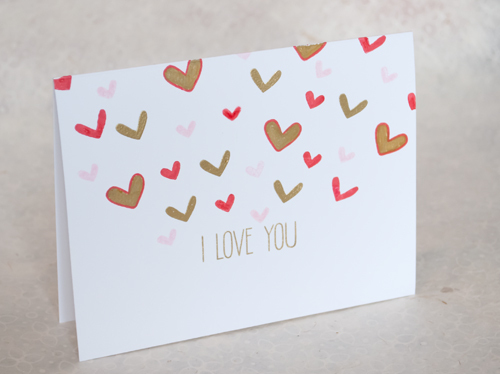 Filled in the red outlined hearts with a Pitt gold pen. MOOD WHEN DONE = Laughing I gave this card to Mike. He made no comment on the card other than to thank me. So I nagged him and he said, "Oh, I like the birds on this card." Good thing he is otherwise a sweetie! LOL! That Mike is a hoot. Beautiful card! This is gorgeous, Joan (and I'm glad to see you back in blog land!) I enjoy your 'mood when done' portions of your posts - I often catch myself noting my mood when I'm done my cards, too! As for your 'birds', they look a little like hearts to me! lol! Thanks so much for playing along with us at CASology this week! Great card! Love the hearts and chuckled out loud about the birds...I've got one just like that at home...but he enables, gleefully, my addiction to cardmaking! Love the colors you've used with the gold, and the sentiment. Read more of your blog. It's definitely genetics. I used to be a thinny skinny mini who ate everything and NEVER exercised. Genetics caught up with me and I have followed the paths of my sister, mother, grandmothers, cousins, aunts... I'm doing a bit better now; a bit better eating, a bit of exercise, but I have a bag of chips in the cupboard for emergencies. No way would those chocolates have lasted...24 hours tops... I'll visit again! Great blog! I'm sure genetics is part of it too. Too bad I didn't take after my super thin and tall mom! Thanks for joining in the FUN at Casology this week!! I adore those little hearts! Fabulous card! Oh, this is beautiful, Joan! And I loved the letter to your mom in the next post, too!